So after getting restless feet myself and Lou decided to take a trip to South East Asia, neither of us have travelled out of Europe in our 9 years together and so we fancied a bit of an adventure. We start our trip on march the 27th where we embarked on a 24 hour journey halfway round the world round the world, a train to London, a tube to Heathrow, a flight to Frankfurt and then on to Singapore. It’s been a long time since I flew long haul, so it was quite an exciting experience, flying on the Airbus A380 which a few of my mates scarily have a hand in manufacturing, we passed the time watching films, playing cards and trying to sleep with the excitement in our belly. So we arrived in Singapore, to be greeted by two very good friends who have been living out there teaching, and it’s very nice to arrive in a new country and have people look after you. We sped off into the night to their condo and then straight out to Holland Village for drinks, food and to meet a whole load international teachers they work with. The first night was a lot of fun, and after nearly 2 days awake we still partied until 4am that day! Our first full day in Singapore started with a fruit breakfast from our lovely hosts and a swim in their pool to wake us up. Next some food at Pasar Bella, a kind of bohemian food market, and then on to Singapore’s ‘Gardens by the Bay’. 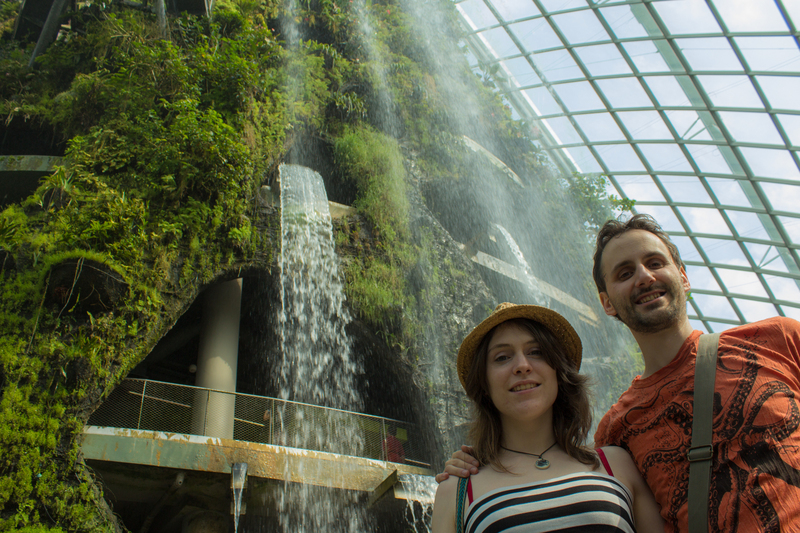 This is similar to the Eden Project in Cornwall, with a few awesome additions which include the largest indoor waterfall in the world which was very fun to walk around, and the ‘Super Trees’. The Super Trees are hard to describe, so you can have a look at the photos. But in the night they light up with a light and music show which was stunning as we lay on the grass and enjoyed the evening. Soon our bellies started to rumble and we headed to little India to an amazing veggie curry house and then home for some sleep as there was a busy day planned for Sunday. So Sunday marked the Malaysian Grand Prix, and as we were so close we just could not resist going, we got up bright and early, and took a flight to Kuala Lumpur with our friend Sim and took the transfer to the race. I’ve been a fan of F1 for 18 years but this is the first race I’ve ever been to and I was not disappointed, the atmosphere was amazing, we got to see some awesome on track action and a few famous faces and watched Hamilton take his first win of the season. we had to run for the plane back home after but made it home safe and sound. 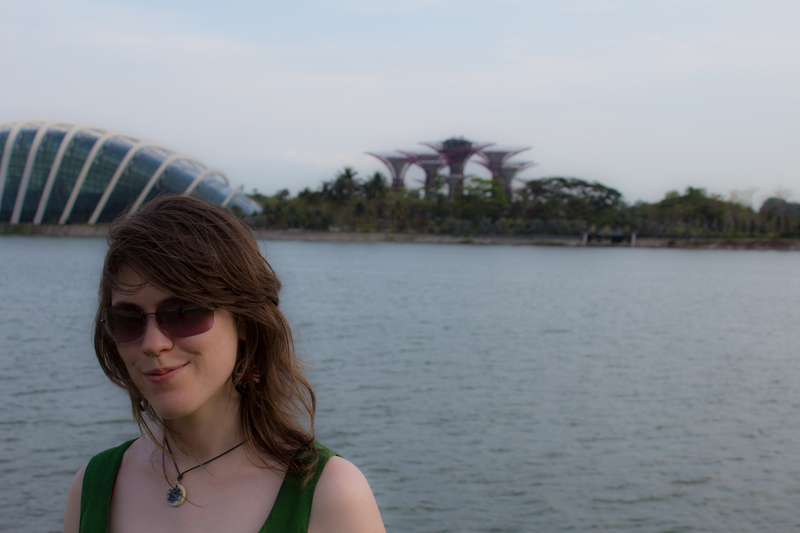 The last day in Singapore, Lou and I were let loose on Singapore alone and proceeded to be all touristy; we first went to Haw Par Villa, some kind of crazy, psychedelic Chinese theme park with lots of creepy and awesome figure displays, built in the 1930’s and based on Chinese mythology and values… But we soon started to boil in the heat headed to raffles hotel for a drink, we got off at the wrong MRT stop (I know Claire, you had warned us in your blog that it’s not at Raffles Place, but did I listen?!?) 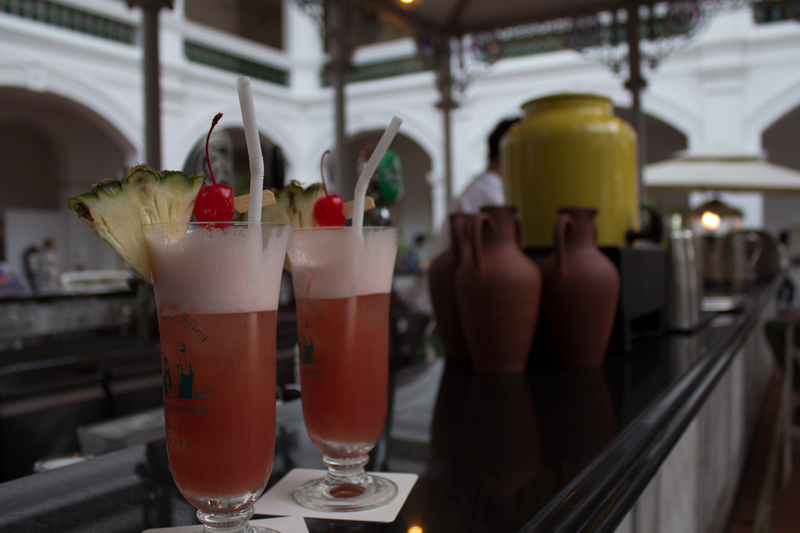 and instead had dinner by the quay, found the Merlion, walked through the deserted pit lanes of the Singapore GP and finally made it to Raffles Hotel for an excellent Singapore Sling to round of our last day in Singapore.